Alright, the Internet, where you can find amazing and stunning gifs, And it is very obvious that most of the GIF images are animated, and they will keep looping. At many instances, you just want to stop a GIF from looping. In short a GIF that will play once and then stops: Interested? Let’s begin. 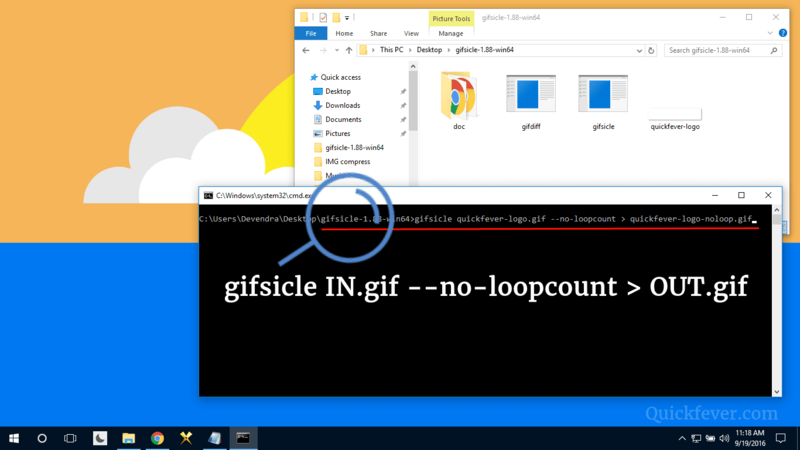 There are both online and offline tools to make a GIF file loop only one time, and we will guide you step-by-step so you will learn how to disable gif loop once and for all. This is a standard GIF loops again and again. This is an optimized GIF (no-loop) plays only once. Pay attention you’ll notice that it only play once, try opening the logo in a new tab and see for yourself. We have a monolithic tool named Gifsicle and is redundancy when it comes to doing things with a GIF file. 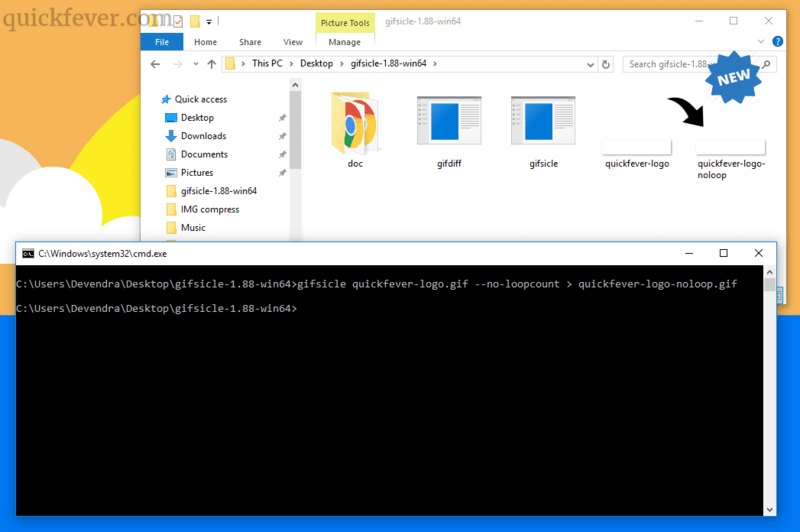 Download Gifsicle builds according to your Operating system and system architecture, most of you are using Microsoft Windows here is a direct link to Windows builds of the software. 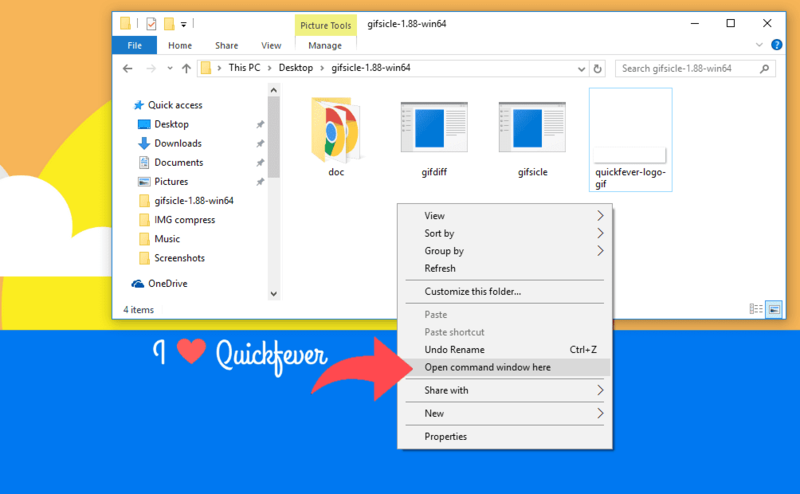 Once you downloaded the software on your PC, You do not have to install this tool on your computer; extract the zip and go inside folder where you can see the tools files. Remember to move all the GIF files in this folder that you want to optimize to play only once. Press right-mouse-click while pressing with keyboard’s SHIFT button, you will see a new option in context menu, Click on the open Command Prompt from here. Didn’t the options? Bring it back. Enter this command line, or simply copy-paste it, you need to replace the gif file name in the command. You’ll see No confirmation of this process check the folder you find the new GIF file that won’t loop. Ezgif is a great website which let you do all the modification you ever want. Here is a catch; in the background, the site’s server uses the same Gifiscle and Magic Images tools. This way is fast and You don’t have to download and install anything on your computer. And you’ll be able to remove endless loops from a GIF. Step 1. Open the Image Split tool on ezgif. Uploaded a GIF file to the website. Step 2. Scroll and click on the blue “Split it!” button. Step 3. Let the page load and then scroll to the bottom where you will find an ”Edit Animation” button click on that. Again wait for all the GIF’s split frames to load, you can edit them with some options. Step 4. Scroll to the almost bottom, there is a few option see for a “Loop Count” setting and input “1” to make your output GIF play only once. Or input a number (x) and your GIF will loop x Times so if you have set 5, your GIF will play 6 times. Things you need to know if you are going to upload the image. Blogger, WordPress and other social media websites will support gif that you optimized to play once. Uploading on site’s like Medium.com will vanish the ability and support to GIF that prevents loops. GIF doesn’t loop on windows? So now you know that we can make gif animation to loop once. You can use this guide to go back and re-add the looping ability to them. Capacity to prevent looping is certainly useful, and this guide will help you do so. Share it with your GIF loving friends. Applies to all browsers based on Chromium engine including Opera, Vivaldi, Ghost Browser etc. Animation Policy is from the Google that comes under accessibility extension, it lets you completely disable animated GIF or let them play for a single time. You can also disable auto-play. Gif Stopper pressing the ESC will stop all the animations leaving a white space. This is good but not what’s really needed. What most people want, I think, is a browser feature or add-on that prevents any and all gifs from looping. It really irritates me to be trying to read something interesting on a web page and have some goofy thing that is completely irrelevant to my life wiggling and jumping in the periphery of my vision.